You need a MIDP 2.0 enabled cell phone in order to play it. 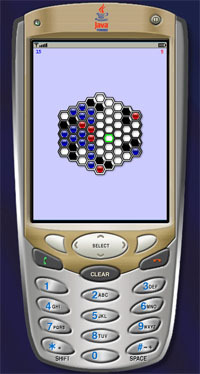 Hexxalite is an abstract strategy board game which involves play by two parties on a hexagonal grid. The object of the game is to make your pieces constitute a majority of the pieces on the board at the end of the game, by converting as many of your opponent's pieces as possible. Hexxalite is a variant of Ataxx.